Klal Yisroel mourns the loss of HaRav Nissan Aharon Tucazinsky, ZATAL, who stood at the helm of Mosdos Etz Chaim, Jerusalem, Many were on hand on Tuesday, 15 Teves 5772 to give a final kovod to Rav Nisan Aaron Tukechinsky zt”l, who stood at the helm of mosdos Eitz Chaim. The rav was 90. The levayah left from Etz Chaim Yeshiva and Talmud Torah on Shmuel Hanavi Street, Jerusalem, at one o’clock in the afternoon. Hespedim were given by HaRav Tuvia Weiss, Gaavad of the Eidah HaCharedis, HaRav Shmuel Auerbach, HaRav Moshe Shapiro,HaRav Menachem Tzvi Berlin, Rosh YeshivahChaim Ozer, HaRav Dovid Cohen, Rosh Yeshivah Chevron, HaRav Nasanel Linder, and the niftar’s son, Rabbi Tzvi Aryeh Tucazinsky, spiritual head of Etz Chaim. The funeral proceeded by foot to the Sanhedria Cemetery, where he was buried next to his father, HaRav Yechezkel Michel Tucazinsky. The rav is succeeded by his children, Rabbi Tzvi Aryeh, Rabbi Shmuel, Rabbi Yitzchak and Rabbi Yosef, as well as many grandchildren, great grandchildren and great-great grandchildren. May his memory be for a blessing. 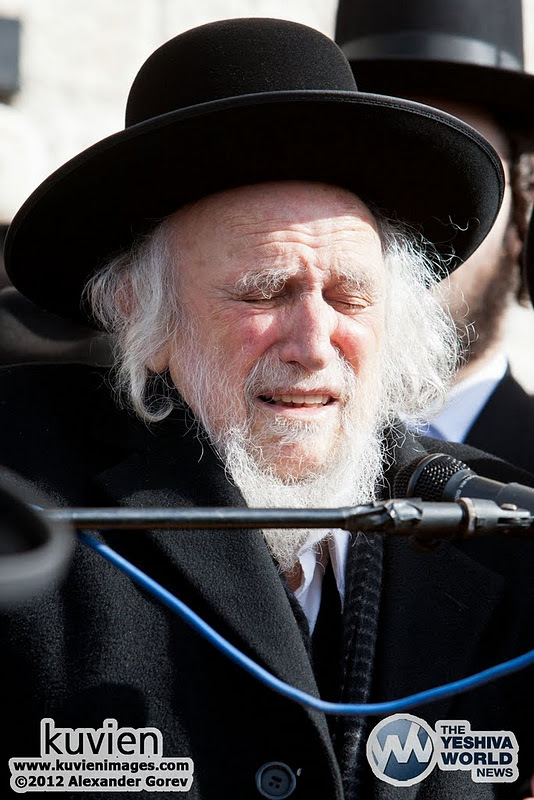 Born on 25 Tamuz, 1922, Rav Nissan Aharon was the son of Rav Yechiel Mechel Tucazinsky, ztz”l head of the Bais Din founded by Rav Shmuel Salant, and author of the classic sefer, Gesher Chaim, and Luach Eretz Yisrael. Rav Nissan Aharon attended Etz Chaim until age 14, when he left home to study at the Lomza Yeshiva in Petach Tikvah. There, he became exceptionally close with the mashgiach, Rav Yechezkel Levenstein, ztz”l. After Rav Yerucham Levovitz was niftar, and Rav Yechezkel Levenstein was appointed the new Mirrer mashgiach, he asked his prize talmid, Rav Nissan Aharon to accompany him to Poland and remain there to study in the yeshiva. Instead, Rav Nissan Aharon stayed in Eretz Yisrael, where Rav Isser Zalman Metzger appointed him to head Etz Chaim, Jerusalem, a position that he kept for close to seventy years. In addition to taking a close, personal interest with each of the hundreds of students studying at the various Etz Chaim institutes, and personally overseeing every member of the staff, Rav Nissan Aharon authored the sefer, Ir HaKodesh V’Hamikdash, published his great-grandfather, Rav Shmuel Salant’s, manuscripts and updated and published the very popular Luach Eretz Yisrael. Rav Nissan Aharon traveled throughout the world, a modern day maggid, for close to fifty years. Although he never requested a donation, he kept the mosdos running and distributed huge sums of money to tzedaka. For himself, he never took more than a regular melamed’s salary, and his simple two room house, without any luxuries — not even a bath tub! — is a living testimony to his yashrus. Rav Tucazinsky was extremely excited about the planned Etz Chaim campus, which is to be built on the site of the old Lemmel School on Yeshayahu Street. The Lemmel School was founded in 1856 by Frankal, who had been sent by members of the Austrian reform movement to provide the children of Jerusalem with a secular non-religious education. At first he disguised his true intentions, as in the words of Rav Ben Tzion Adler, “He kissed the mezuzah when he entered, and he kissed it again when he left. He wore 2 pairs of Tefillin and there was a huge ‘shvisi Hashem’ sign behind his desk, but the rabbonim realized that it was all a bluff.” The Lemmel school had what appeared to be unlimited funds, and, at the time, many assumed that religious community would dwindle, until eventually it would disappear in favor of the “enlightenment.” Today, things have come full circle and work will soon begin to convert the Lemmel School into a makom Torah. YWN PHOTO LINK: Click HERE to see the photos. Click HERE to watch this video from a mobile device. Excellent write up. I’m sorry but I think you mean R’ Isser Zalman Meltzer above. I don’t think the information about the Laemel school should have been so obviously negative. It is well-known that Rav Yosef Carlebach (later the Rav of Hamburg) taught mathematics and natural science there with the Haskama of his Roshei Yeshiva in Hildesheimer Rabbinical Seminary as well as with the Haskama of Rav Shmuel Salant. Perhaps other Torah personalities taught there at the time, imbuing the children with Torah values together with the secular studies in the true spirit of Torah im Derech Eretz.